Welcome to Interfaith Org, the world's largest independent faith website. Explore the world's major religions: Buddhism, Christianity, Confucianism, Hinduism, Islam, Judaism, Shinto, Sihkism, Taoism. Explore the ancient mythology of the Celts, Mesopotamians, Mesoamericans, Romans, and Egyptians, and more. 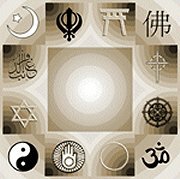 A library of interfaith articles dealing with belief and spirituality, across a range of faith and non-faith belief. Are spiritual people really superior to others? Does an awareness of the universe lead to a form of spiritual fascism? Join in at our forum for this discussion: Spiritual Fascism?.